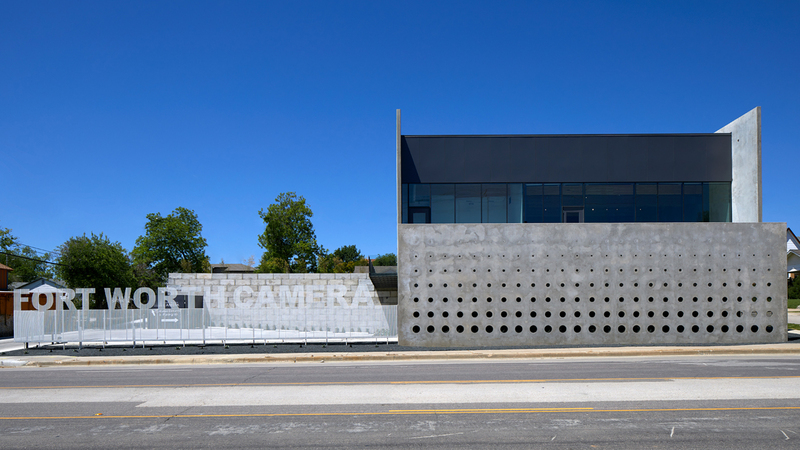 The Fort Worth Camera building, a new photography studio and retail space, is surrounded by notable concrete neighbors, the Modern Art Museum of Fort Worth by Tadao Ando and the Kimball Art Museum by Louis Kahn. Ibanez Shaw Architecture responded with its own concrete novelty inspired by the building’s program. The primary facade is a site-cast concrete panel system which used tilt-up construction with steel anchors cast into the wall. The concrete wraps the perimeter of the building and transitions into an aperture screen on its most prominent street frontage. Ibanez Shaw decided upon concrete as the best material because security was a major concern for the client. The concrete provided protection at the street level and all the glazing on the building was either elevated above ground or made too small for a human to fit through. The seven standard aperture settings of a camera lens inspired the design of the concrete feature wall. The shape and proportions of the apertures were directly translated from these lenses and then modified to make them into standard-size openings. The formwork for the wall was made by gluing wood blocks together, which were then vacuum formed into fiberglass. The array of 25 fiberglass shapes were filled with grout and then cast around to create the screen wall. Because each hole is conical in shape, the aperture wall faces toward the interior and allows light and views into the courtyard. Across the courtyard from the concrete screen is a glass wall that allows views into the studio spaces. There was some initial concern about how the concrete would turn out. Bart Shaw, principal of Ibanez Shaw Architecture, told AN that with concrete, “you never know what’s going to come out. This big perforated concrete wall is going to sit across from the museum district, and when they lifted it out of the formwork it was pretty incredible.” The fiberglass formwork gave each aperture a smooth finish and release which contributed to the aesthetic of the wall. Aside from the concrete aperture wall, there is another distinguishable feature to the facade: a large window with a yellow steel enclosure. This glazing fronts a children's area on the interior and creates a framed window nook that faces the adjacent residential neighborhood. It is also the only glazing on the north facade of the building. The rest of the glazing fills the east and west facades. Architects and designers are taking design to the next level by incorporating technology-advanced architectural glass into both residential and commercial projects. From LED glass to sound-absorbing glass, architectural glass and technology are coming together to conceive new and innovative design options. Polymagic LED Glass Polytronix A conductive surface coating allows LED lights to be embedded into these glass panels without wires. The energy-efficient LEDs can be arranged into custom patterns. Available in five colors, the lights can be flashed or dimmed. The product can be laminated with many different glasses, including tempered, low-iron, and printed types. AviProtek Walker Textures It’s been proven that glass with specific visual markers can effectively prevent bird collisions in buildings. 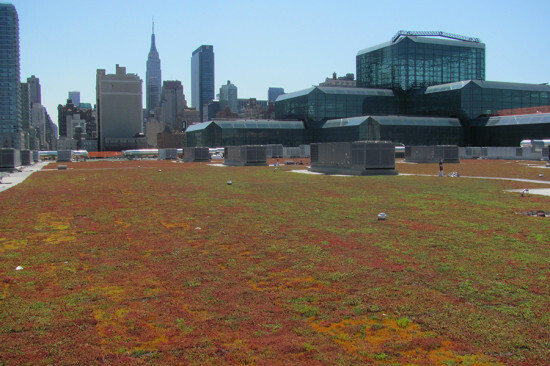 This collection of glazing solutions has been designed to meet both bird-friendly criteria as well as the aesthetic intents of architects and solar performance targets. 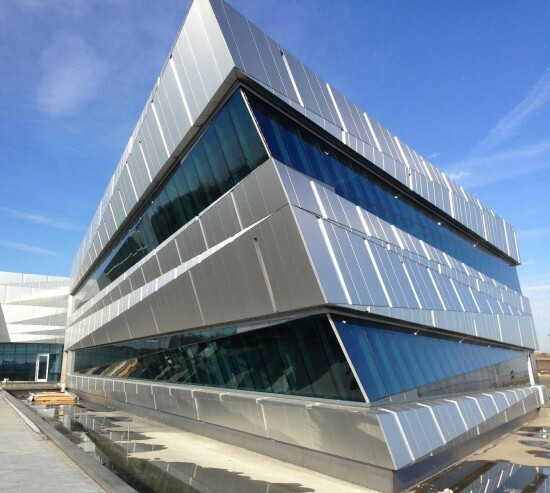 Solarban 90 PPG SOLARBAN 90 glass is a low-emissivity glass that combines industry-leading solar control performance with a true neutral-reflective, clear-glass aesthetic. Solarban 90 glass has a solar heat gain coefficient of 0.23, visible light transmittance of 51 percent, and a light-to-solar-gain ratio of 2.22 with clear glass in a one-inch insulating glass unit. Liquid Crystal Window Technology Merck KGaA Darmstadt Liquid Crystal Window technology enables windows to be switched in seconds from light to dark and vice versa, creating a comfortable interior environment without employing conventional shading solutions. 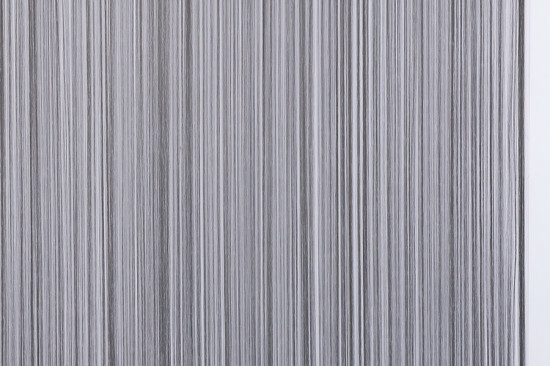 Trosifol Sound Control Kuraray This noise-attenuating PVB acoustic film offers an improvement of up to three dB in sound insulation values. Additionally, it has 88 percent light transmittance and a low yellowness index. Eco-etch achieves varying levels of opacity, and AST Digital Glass Printing introduces color to partial transparency. These options provide for customization of classic patterns like Divine and Enchantment, designed by Dorothy Cosonas, or the mid-century Cyclone and Fibra, designed by Eszter Haraszty. Liquidkristal Lasvit Designed by Ross Lovegrove, Liquidkristal was inspired by dynamic forms found in nature. The design was first modeled digitally to simulate thermo induction, which can imbue the qualities of water to glass under very high temperatures. A large-scale mold system was formed from the study’s results, to produce multiple pattern variations over multiple sheets. 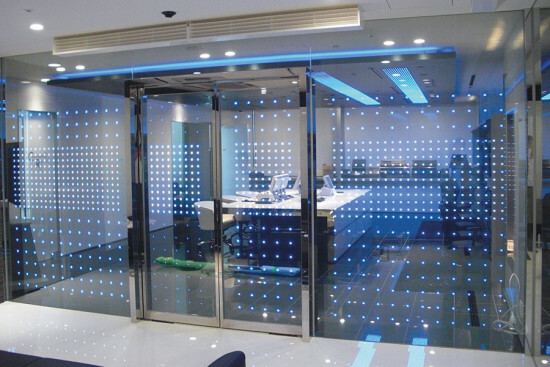 In addition to interior applications, Liquidkristal is also suitable for glazing and facades. Olivia Joel Berman Glass Studios The circular, three-dimensional pattern of Olivia is enhanced with subtle reflectivity to inflect motion into any space. Back painting options are available in a range of colors on panels measuring 53 by 108 inches. Produced for interior applications, it can be tempered for safety and impact resistance on exteriors as well. ClearShade Glazing Unit Panelite A honeycomb-like insert fits between two sheets of glass and redirects up to 70 percent of natural light, reducing solar glare and heat gain for midday-SHGC measurements as low as 0.11. The cellular configuration is made from a durable but transparent polymer that is resistant to UV rays. The product’s bi-directional scattering distribution capabilities are compatible with Radiance, Energy Plus, and SketchUp modeling programs. Sungate 600 PPG This double-glazed insulated glass unit boasts an efficient configuration tailored to the region of application. In climates where heat gain is optimal, coating on the Number 3 surface blocks heat loss for a U-value of 0.33, while maintaining a 0.65 SHGC and visible light transmittance of 71 percent. For higher insulation values, the Sungate 600 coating can be placed on the Number 4 surface when combined with a solar control low-e glass, for a net gain in U-value of 20 percent. SageGlass Simplicity Sage Electrochromics This electronically tintable glazing is available in a solar-powered, wireless format. In lieu of low-voltage wired connections, a strip of solar photovoltaics interfaces with a low-profile electronic controller and battery pack that can provide power for up to two days without a charge. The wireless system also configures with light and building management programs from Siemens, Lutron, Schneider, and Johnson Controls. Bistro Green Vetrazzo Vetrazzo, the recycled glass division of Polycor, has been diverting glass from the waste stream since 1996. The surfacing material uses consumer beverage containers, waste from glass manufacturers, building demolition, traffic light lenses, windshields, shower doors, and more. It takes nearly 1,000 bottles to make one 5- by 9-foot panel that is 85 percent glass by volume and bound with Portland Cement. Sixteen of Vetrazzo’s product lines are Cradle to Cradle certified. Dynamic Glass View Glass Insulated glass units as large as 5 feet by 10 feet feature programmable electrochromic levels of 60, 40, 20, and 4 percent tinting with user controls from a smart device app to reduce heating and cooling loads, electric lighting, and solar glare. An intelligent setting can be programmed for sensory occupancy to optimize energy usage as well as user comfort. All four tint levels can be achieved in one unit, with adjustment times akin to the passing of a cloud overhead.